TSA Self-selecting security lanes are an idea that has come and gone. You won’t find these anymore… Now you should look for TSA Pre✓™. It may not seem like it, but really... they are trying. Back a few years ago, they thought that different lanes for travelers with different levels of experience might speed things up. They weren’t implemented at all that many airports. At those airports where the process was implemented, it seemed to cause as much confusion as help. Did you ever hear of them or run into them. Participating airports had black, blue and green lanes for security... and names for those lanes which weren’t always consistent... so that whole idea went away. You may see it as TSA Pre✓™. 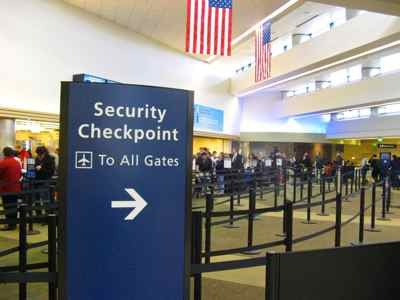 Some passengers are randomly selected for PreCheck at airport check in... Though the confusing thing about that is not all passengers who are randomly selected may know it... if they don’t know what they’re looking for on their boarding pass! If it’s something you’re interested in, you can also sign up for PreCheck... for a price! Read more about that on our page about trusted travelers. All I can tell you is that we will have to deal with security checks for years to come. Although I was randomly selected on a recent trip and Mark was not. We went through separate lanes... and he got through faster! Most of the time PreCheck lanes are faster and there are less hassles, but we will all have to wait and see if it really works, or if it’s another idea that will go by the wayside like those TSA self-selecting security lanes. It was an honor system, and it was up to the individual traveler to decide which lane to be in. ...let alone having to decide which lane to get into! ...Or if you were only a Frequent Traveler who should use the blue lanes. And aren’t frequent travelers usually pretty expert? But wait... sometimes the blue lanes were for Casual travelers. The Green Lanes were meant to be for travelers who really needed extra time... families or people who just didn’t know what they needed to do. But if the lane was marked as a “special assistance lane” or “medical liquid lane”... maybe a family would feel like they shouldn’t go there. The black lane was supposed to move the fastest, but it didn’t always. Add to that the fact that the TSA needed to have more personnel for the added lanes, and it all ended up being a noble experiment that just didn’t work. Like I said... an idea which has come and gone. Airport Help - The Airport Is Your Friend!